By the early 1920s, real estate development was booming all around Los Angeles. For decades, the city had boldly advertised itself as a mecca in which average citizens could earn their share of the American dream under glorious sunshine and surrounded by beauty. Los Angeles expanded west and north as the population exploded, and homes evolved from simple bungalows into elegant abodes. Neighborhoods such as Whitley Heights and Windsor Square catered to more prosperous Angelenos: movie stars, bankers and oil men. Streetcar tycoons and real estate moguls Eli P. Clark and Moses H. Sherman seized the moment to begin selling a long-held piece of property above Hollywood. Arizona transplants Clark and Sherman arrived in Los Angeles in 1889, quickly laying the first streetcar lines in the city in 1893. Sharp and astute, the men bought up surrounding property adjoining or near their streetcar routes, opening them up for development when population began growing in those areas. They took as a partner Harrison Gray Otis, publisher of The Los Angeles Times, in order to gain free advertising via stories, photographs, and mentions in the paper. Upon Otis’ death, the new Times Publisher Harry Chandler joined the syndicate, and continued freely promoting their ventures. In 1905, Clark and Sherman bought 640 acres at the top of what would soon be called Beachwood Canyon from Mrs. Julia E. Lord. Developer Albert Beach would name the canyon and the street extending into the canyon from Franklin Avenue after himself in 1911. The Clark and Sherman Land Co. operated a granite quarry on the site for years, biding time until interest in the Hollywood Hills was ripe. On March 31, 1923, a story appeared in The Los Angeles Times announcing that the Sherman and Clark ranch land would be available for sale under the name Hollywoodland. 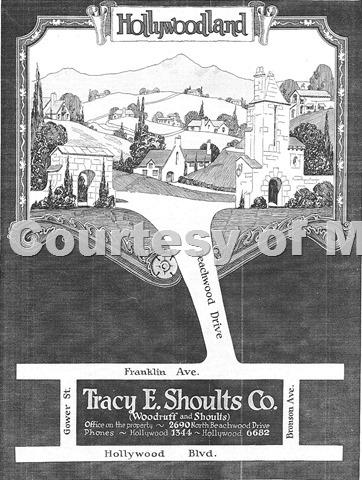 Real estate developers Tracy E. Shoults and S. H. Woodruff would promote and sell the land, with Title Insurance and Trust Co. handling certificates of title. Shoults was a well-respected veteran of Los Angeles real estate, with 20 years of experience, ranging from South Los Angeles up to Windsor and Marlborough Square, his latest projects. These areas featured large lots on which elegant homes were constructed by the upwardly mobile. Woodruff, his second in command, was lucky to be included in the Hollywoodland project. With a checkered past stretching from New York to San Francisco and eventually Los Angeles, Woodruff had skirted jail time, though not suspicion. His job was to complete Shoults’ and the other partners’ visions. The developers proudly proclaimed themselves to be the first themed housing development constructed in the hills. To give the area an air of distinction, only four types of architecture could be employed in constructing homes: English Tudor, French Normandy, Mediterranean and what they called California Revival, an update of Spanish Revival. The development would feature its own small business area of grocery stores, a gas station, barbershop, beauty shop and cleaners, along with another first, their own stables. Bus service would extend into the neighborhood from Hollywood, with jitneys transporting residents to and from their homes. Granite from their quarry would serve as retaining walls, stairways and terraces. Shoults and Woodruff soon hired two men who helped shape the area into an exclusive and elegant enclave: architect John L. DeLario, and publicity man L. J. Burrud. DeLario possessed an architecture degree and experience designing homes in the Windsor Square/Hancock Park area. He would go on to create several of the iconic homes for which the neighborhood is known. Burrud stood out for his background in newsreel and documentary footage, shooting short films promoting car companies. He envisioned new ways of promoting the project to the public, such as shooting newsreel footage, making a documentary film recording the construction of a home, creating a radio show promoting the development and even a band that trumpeted the tract playing at Ralphs grocery store openings and on the radio show. The most iconic element promoting Hollywoodland would be constructed months later, when Chandler himself hired advertising man John Roche to design a large sign advertising the property. A rickety sign composed of telephone poles, pipes, and chicken wire spelling out the word “Hollywoodland” in giant letters, like many other real estate signs, was erected. While the others eventually disintegrated in form and memory, the Hollywood Sign evolved from advertising sign into a worldwide icon representing the city of Hollywood to the world. Mary’s book is available in paperback and for the Kindle. This entry was posted in 1923, Architecture, Film, Hollywood, Hollywood Heights, Mary Mallory and tagged architecture, hollywood, Hollywood Hills, Mary Mallory, real estate. Bookmark the permalink.